Did you catch our recent blog post highlighting 5 reasons why arts teachers are important? In this we outlined our feelings on why young people should be offered the chance to access the arts at school, and expressed our view that the role of arts teachers in ensuring that this experience is valuable and meaningful is as vital for students as exposure to any of the non-arts subjects. We also urged arts teachers to celebrate the work they do. As this post feels to have struck a chord, to follow on we wanted to offer some suggestions for boosting the profile of arts subjects in schools. We've put together a selection of approaches that we hope will be helpful to any arts teacher looking to command more attention for their subject. That’s regardless of your discipline, school intake, location, or (dare we say it) perhaps even budget. This can be an artist in the widest sense – an author, a musician or a craftsperson, for instance. Which artform would best fit with your offer? Can you link the visit to any wider initiatives or themes taking place at your school to bolster the prominence of the event? Or if your local community has a particular cultural make-up, the type of performance or artform you choose could perhaps reflect this. Your local Bridge organisation may be able to help suggest good places to start, or you could use the Arts Award Supporter map to find arts organisations near to you that have specific offers for young people. With a bit of delving into your school’s existing connections, you may be able to find people who are happy to come into school at no, or very little, cost. Whether focussed around a production, concert, exhibition or something else entirely, sharing events put your department in the spotlight and are a great focal point for students to work towards. 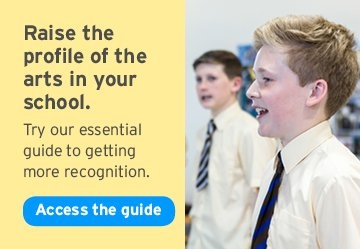 This is your opportunity to celebrate your great work, so hold it at a time that will allow the most parents to attend and don’t forgot to invite your senior team and school Governors. Event planning can be time-consuming, so why not also get some of your older students to get involved in managing your event, or part of it? This is a great student leadership opportunity, and could contribute towards a Silver or Gold Arts Award as well. 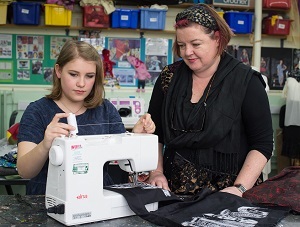 Is your school production supported by all arts subjects? Depending on your discipline, could your students help with the music, costumes, props, set design, dance/movement or on the acting side? Perhaps even the script! Working with other departments on whole-school events will amplify the experience for everyone involved and individual budgets may stretch further if combined. If exams and external validation is important to your school Trinity College London offers whole production exams which can celebrate all roles - the backstage and technical just as much as those on stage - helping to create real sense of whole-school teamwork and achievement, as well as raising the profile of your department. Giving students a platform to talk about your subject can be hugely beneficial for everyone. Students hearing from their peers can be a powerful aide to student recruitment and assemblies are perfect for this. What other opportunities exist for students to sing your praises? Perhaps to parents at options meetings or parents evenings. Students who enjoy your subject will be passionate advocates and they will be delighted to have their voices heard. When you’re busy in the day-to day in the classroom, alongside running clubs and additional responsibilities, it’s easy to forget to share your achievements. Make it a priority to celebrate students work regularly and if possible create possibilities for future good news such as entering students for competitions or graded exams. What communication channels are available to you? Your school will probably have a newsletter or website, and perhaps even a Twitter, Facebook or Instagram account. If not, would SLT be supportive if you created an account to celebrate the good work of your department and which would of course reflect positively on the school? These are just some ideas and doubtless you will have your own. We are keen to support arts teachers to celebrate and advocate for their department as we believe the work you do is vital. With this in mind we have produced a new guide: Flying the flag for the arts. Here you can find more ideas like these, and many more suggested approaches for getting more recognition. The guide is free to download in exchange for an email address. And if particular things you've tried have worked well to raise the profile of your department, why not share with us in the comments below? We’d love to hear them.